We know many families may look for fun and meaningful activities to keep young children busy while allowing them to feel an important part of the holiday celebrations. Below are just three of our favorite activities. 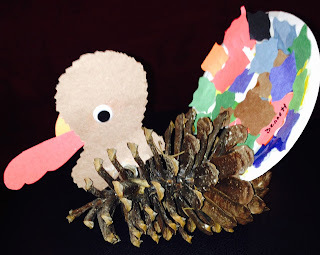 Collect pine cones and have children use a paper plate, torn scraps of paper, and a pre-cut turkey head to make the centerpiece for the Thanksgiving dinner table. See for yourself how festive this looks. And won't your child be thrilled with his/her contribution! Find engaging books like 'Twas the Night Before Thanksgiving by Dav Pilkey for a different view on the holiday celebrations. 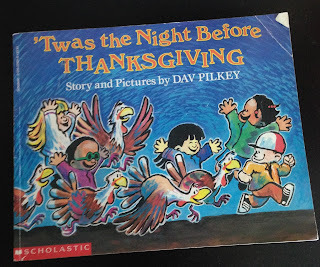 This book has the added benefit of being all in rhyme (much like 'Twas the Night Before Christmas) so it encourages pre-reading skills. Families can give their children the task of making a disguise for a turkey, too. Trace your child's hand to make the traditional turkey. Cut it out, and give it to your child. Let them use scraps of material to make the turkey look like something else so it can hide. Will they dress it like their pet, a football player, or even an object like a chair? Let them "hide" their turkey. Finally, while family members are busy cooking, tell children to decide on their favorite Thanksgiving dish. Have them draw pictures of how to make this yummy food. This supports an understanding of sequence, but it may also produce a lot of laughs as you might see your child thinks 15 cups of sugar go into a pumpkin pie!